Simonson Hess Leibowitz & Goodman, P.C., a New York based medical malpractice and personal injury law firm named one of the “Best Law Firms” in Medical Malpractice Law in the 2011-12 U.S. News Law Firm rankings, has launched a best-in-class responsive web site developed by Trighton Interactive. Research shows that consumers and clients are using multiple devices to research services before deciding to make personal contact with a law firm. That’s why Simonson Hess Leibowitz & Goodman, P.C. 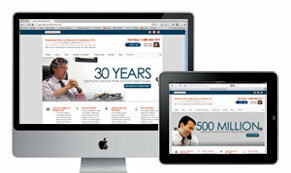 is so smart to go with responsive website design. Designed for people who need resources on gastric bypass malpractice, the web site is informative, visually appealing, and easy to navigate. As a leader in medical malpractice, weight loss surgery and personal injury law, Simonson Hess Leibowitz & Goodman, P.C. recognizes the need for innovation in legal marketing. That’s why they chose Trighton Interactive, a leader in innovative online marketing, especially responsive web site design. The team of legal experts at Simonson Hess Leibowitz & Goodman, P.C. responds to each client’s needs, providing top quality, personalized attention. They want a web site that conveys their concern for each client, as well as their expertise and success in working on behalf of clients affected by gastric bypass malpractice. To view Simonson Hess Leibowitz & Goodman, P.C.’s new responsive web site, visit http://gastricbypassmalpractice.com/.